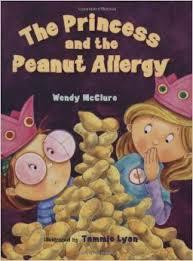 Wendy McClure’s The Princess and the Peanut Allergy is a wonderful story about a young girl named Regina who is planning her birthday party. She has invited all of the girls in her class, including her best friend Paula. Regina is thrilled about her upcoming birthday celebration and announces to her friends that it will be a princess party with fun activities and a castle cake made with chocolate nutty brownies and peanut butter candy. When Paula hears about the cake, she tells Regina that she cannot eat anything that has peanuts in it because peanuts make her very sick, so much so that she once had to be hospitalized after accidentally eating one. Regina becomes very upset with Paula, thinking that Paula is trying to ruin her party. The girls get into an argument and they each go home to tell their parents what happened. When Regina talks to her mom about the situation, her mom decides to read The Princess and the Pea to Regina, so she might understand that Paula, like the princess, is not responsible for the unfortunate situation. After thinking about the story, Regina asks her mom to return to the bakery and order a new cake that contains no peanut products. Regina is very happy to tell her best friend that she will not be able to enjoy the birthday cake. The book ends with a note written by a doctor who is with the Food Allergy Institute at Mount Sinai School of Medicine to parents and friends of children with food allergies. Element #5 is about characters raising awareness of other characters. In this book, Regina is made aware of peanut allergies by her best friend Paula and Regina’s mother helps Regina understand that it is not Paula’s fault that she, like many other children, is allergic to peanuts. Regina then raises awareness of peanut allergies by making sure that the food served at her birthday party can be enjoyed by everyone. I would use this book as part of a lesson introducing students to food allergies. Many classrooms today are “peanut safe” or “allergy aware” and discussing food allergies with students has become a rather common activity. I think this book would be especially helpful if a student in the class or students in the cafeteria have a peanut allergy. After reading this book, I would have any students with food allergies share their experiences in school. If I had no students with food allergies, I would ask them to think about ways in which they could be mindful of other children with food allergies they may encounter.